Earlier this month we released Flickr’s Year in Review, which took a look at the top cameras and device types used by the Flickr community in 2015. We’re excited to drill down and dive deeper into those findings of the top device types used by the Flickr community, the most popular brands among our users, and the top cameras used on Flickr this year. A quick note on how we count cameras: we’re looking at how people take pictures they upload to Flickr, so for a given time period we only count each camera once per community member who uploads to Flickr. So for example, when looking at 2015, my two favorite cameras this year – my Canon 7D and its partner-in-crime the Fujifilm X-E2 – only get one vote each. We’ve also tuned how we count camera categories so some numbers changed around minimally compared to our post earlier this month. Looking at the trends over the past 5 years, we can see that Point-and-Shoot cameras are continuing their steady decline, losing their popularity to cameraphones. 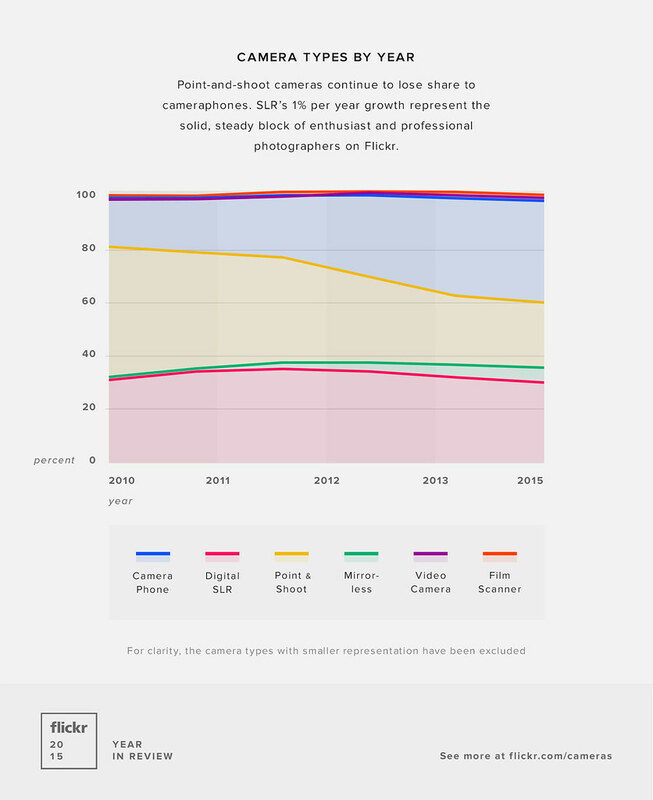 After a peak in 2012, SLR’s are being replaced by mirrorless cameras, which show a steady one-percent-per-year growth. These two camera types represent the solid, steady block of enthusiast and professional photographers on Flickr. 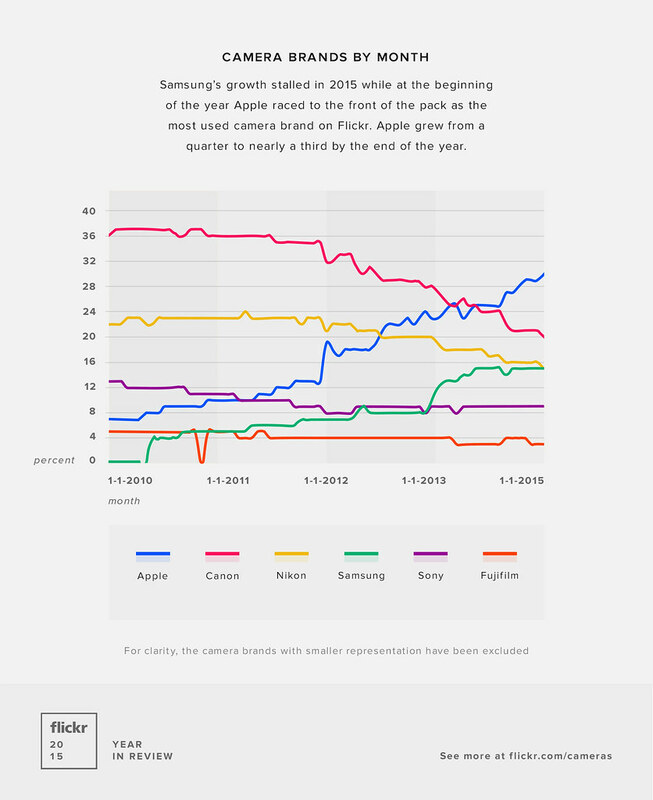 The rapid ascent of Samsung stalled out in 2015; however, at the start of the year Apple raced to the front of the pack as the most-used brand for taking photos on Flickr. Apple grew from a quarter to nearly a third by the end of the year. Canon’s share fell significantly and Nikon continued its slow decline; however the last two major players – Sony and Fujifilm – stayed pretty steady throughout the year. Flickr photographers seem to have a strong brand loyalty, but a good fraction of our community is happy to use different brands together. In 2015, 18% of Flickr photographers used Apple and Canon together, followed by Nikon at 15%. 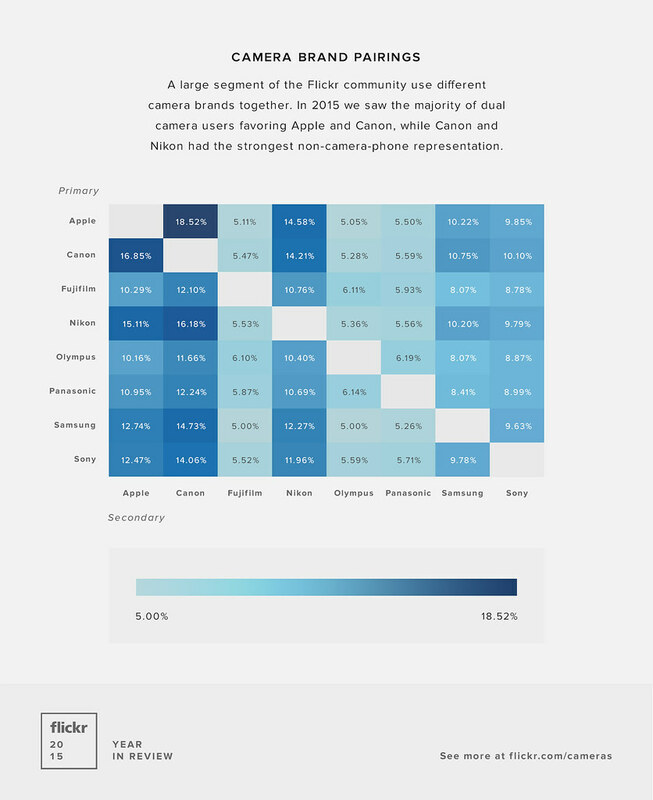 11% of the Flickr community used traditional rivals Apple and Samsung together. Unsurprisingly traditional cameraphone and DSLR pairings dominate this list. 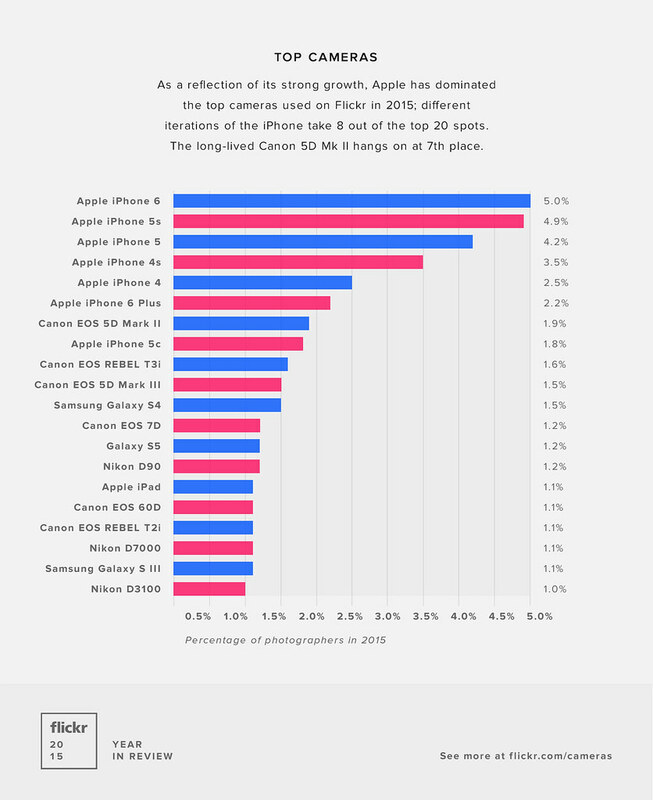 As a reflection of its strong growth, Apple has dominated the top cameras used on Flickr in 2015; different iterations of the iPhone take 8 out of the top 20 spots. The long-lived Canon 5D Mk II hangs on at 7th place and its newer sibling the 5D Mk III is at 10th. Entry-level Canon Rebel T3i is at 9th place. The first Android device, the Samsung Galaxy S4, is at 11th and the first Nikon, the D90 is at 13th place. We’re very happy to announce the newest Flickr Heroes cover photo winners for the week! Does your family have any special #ChristmasTraditions? Show us what you do to celebrate the holidays!